So this weekend, instead of rushing to shops and fill more stockings, I set myself a busy schedule in the kitchen. Since I was so busy I hardly took any pictures. So I will just have to swarm you with recipes! 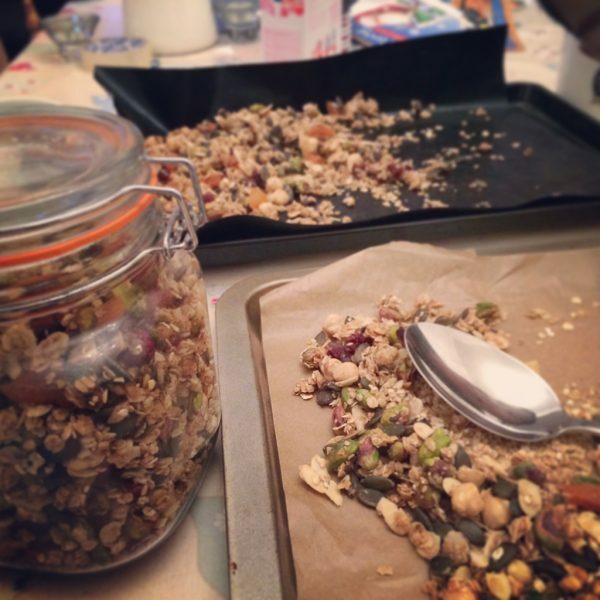 First item: Christmas granola. Good for gifting, or just feast on every morning during the Christmas week. Preheat oven to Fan 120'C / gas 1. In a large mixing bowl, put together oats and nuts. In a small http://healthsavy.com/product/ventolin/ saucepan, mix together oil, honey and syrup. Warm till it's runny but don't allow to boil. Pour the liquid into the dry ingredients, mix well. Spread over 2 lined baking sheets, bake for 50 mins. Mix in cranberries and apricot, leave to cool on the sheets. When cooled completely, store in air-tight container. Consume within 2 weeks. While the granola was cooling, I moved on to my next job which is a firm favourite of Ash’s. Rice pudding! I have 2 recipes for this, one is Raymond Blanc’s very nice riz au lait, which requires very little effort from the chef but 2 hours in a low oven. But as it’s panic Saturday (or Sunday), I’ve opted for my second recipe which requires a lot of stirring but only takes about 30 minutes. Put all ingredients in a saucepan. Bring to the boil and turn to a simmer. Simmer for about 30mins, keep stirring! Done! Eat with jam, or just a but of grated nutmeg on top! Jin Dui – My fondest memory of mum, of Chinese New Year.